The primary purpose of Wood Badge Training is to strengthen Scouting in our local units, districts, and council by helping Scouters develop new skills, and build strengths. 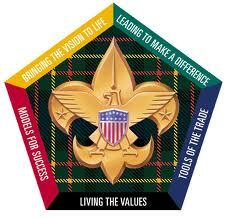 ¨ The Wood Badge Course brings together leaders from all areas of Scouting. ¨ Outdoor experiences where you will develop a personal plan for putting the leadership skills you are learning into practice. A BSA Annual Health and Medical Form A, B and C, is required for attendance. We will make accommodations for any and all ability levels. Contact the Course Director with any special needs or concerns you may have to arrange appropriate accommodations.